Aqua-Man has nothing on Guillermo Del Toro's interspecies love story. 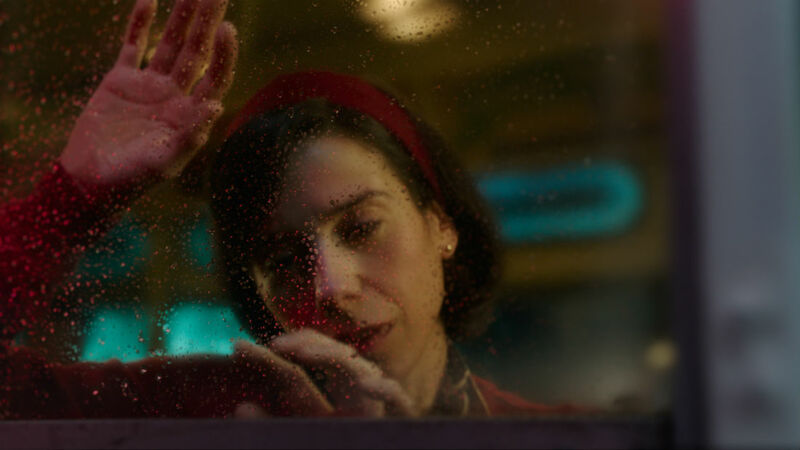 Sally Hawkins is caught up in the raptures of love in "The Shape of Water." You know that Guillermo Del Toro is Mexican, and his latest cinematic fairy tale The Shape of Water is set in America, but watching it, I kept thinking about how oddly French it felt. The romanticism leavened by whimsicality, the visuals balanced on a knife’s edge, and the music by Alexandre Desplat put me in the mind of a dainty French confection. Specifically, it felt like Amélie. I’ll readily admit I’m not as high on this somewhat derivative romance as many of my colleagues are, but it is something to see on the big screen as it expands into Tarrant County theaters this weekend. 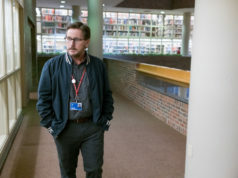 The story is set in 1962, when Elisa (Sally Hawkins) is a mute but not deaf woman who works the night shift as a janitor at a secret government facility outside Baltimore, befriending two other lonely souls in co-worker Zelda (Octavia Spencer) and next-door neighbor (Richard Jenkins). She’s given an unwelcome glimpse of what goes on in her workplace when a scaly, amphibious, gilled Amazonian river god (Doug Jones) is brought in as a biological specimen. Elisa — that name pronounced like “Eliza” — teaches the creature sign language and plays music for him when she cleans the lab where he’s being kept. However, when she overhears the facility’s director Strickland (Michael Shannon) planning to vivisect the fish man for scientific study, she resolves to break the captive creature out and release him back into the wild. This is the first Oscar-caliber showcase that Sally Hawkins has enjoyed since 2008’s life-affirming Happy-Go-Lucky. This exceptionally plain-looking British actress can look either ancient or impossibly young when the occasion calls for it (she’s 41, if you must know), and she vibrates with an energy and profundity that makes her more interesting to watch than a thousand Hollywood hotties. The film boasts some beautiful supporting performances by Jenkins as a closeted gay commercial artist who serves as the film’s narrator and Michael Stuhlbarg as a scientist with his own agenda, but Hawkins owns this show completely with her dancer’s grace and her face that lights up as Elisa experiences love for the first time in her solitary life. It’s a pity that screenwriters Del Toro and Vanessa Taylor so transparently set up Strickland to be hissable. The villain here is irredeemable: a racist, a bully, a sexual predator, a torturer, and a guy with revolting personal hygiene. You wish for a bit of cleverness or imagination to at least make him a worthy adversary. Del Toro did a better job of explaining how his bad guys came to be in Pan’s Labyrinth and Crimson Peak. That said, Shannon is really scary here, never more so than when he intimidates Zelda by towering over here and comparing himself to the Biblical Samson and his determination to take down the Philistines. He deserved a more shaded-in role. I suspect that my colleagues have fallen for The Shape of Water because it’s as besotted with old movies as it is with storybook romances, but you’d be churlish not to recognize the immense craft that goes into this surpassingly beautiful work. This may not be among Del Toro’s best films, but this tender love story fully belongs on the same shelf. Starring Sally Hawkins and Doug Jones. Directed by Guillermo Del Toro. 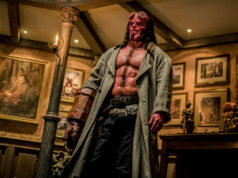 Written by Guillermo Del Toro and Vanessa Taylor. Rated R.